Technical analysis or Charting allows investors to use a range of patterns to assist them with timing their entry to and exit from positions. 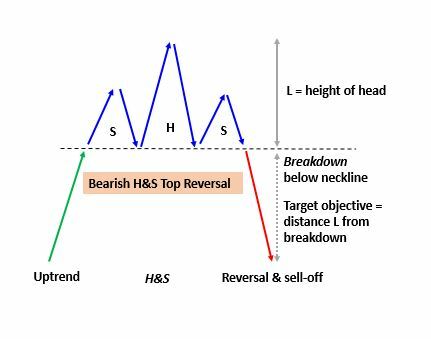 Head & Shoulders are reversal patterns (like double/triple tops/bottoms and wedges) that form at the top or bottom of a trend with the bottoms being Bullish and the tops being Bearish. Each can can be split into distinct sections that help identify when the patterns are forming, helping ready the investor for the next move, be it higher or lower. The initial rally into the pattern can be steep or gradual. The first shoulder is formed where the price peaks before falling back to a level of support – the neckline. Once the shares reach the neckline, they then bounce to post a higher peak, before retreating again back to the neckline. The shares then rebound once again from the neckline, this time reaching a lower peak than the previous neckline bounce managed to reach. The pattern is only confirmed once the sell off from the second shoulder breaks below the neckline, after which the target objective is equal to the distance from the neckline to the peak of the ‘head’. The initial sell-off into the pattern can be steep or gradual. The first shoulder is formed where the price troughs and rallies back to a level of resistance – the neckline. Once the shares reach the neckline, they then sell-off to post a lower trough, before rallying again back to the neckline. The shares then sell-off once again from the neckline, this time reaching a higher trough than the previous neckline sell-off. The pattern is only confirmed once the rally from the second shoulder breaks above the neckline, after which the target objective is equal to the distance from the neckline to the trough of the ‘head’. 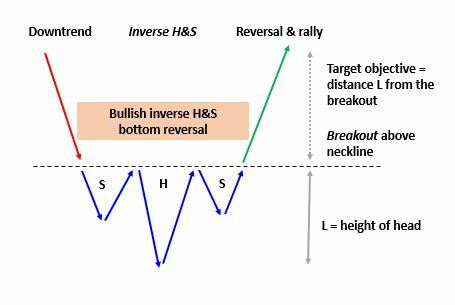 Whilst trade objectives are calculated by assuming and projecting the height of the head and shoulders pattern, note that they don’t always deliver a move equating to the full pattern height. Sometimes they undershoot. Sometimes they overshoot. And the pattern itself is not always perfectly neat. What is most important is that overall pattern respects the general steps mentioned above.